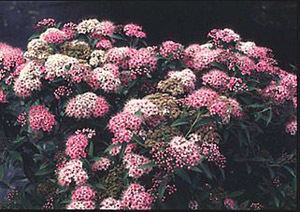 The Shirobana Spirea can bring character to any landscape planting. Taller than most japonica at up to 4', it can display up to three different colors of blooms, varying from white to link pink to a darker, reddish-pink. Often there will be a cluster dedicated to a single color, and the very next cluster will product flowers of a different color. This variety may also provide blooms sporadically throughout the growing season. Foliage is slender and green with toothy serrations and an average sized leaf (2" long). The sunlight requirements for the Shirobana are the same as most other Spirea; it likes full sun but will accept slightly less. It will also adapt to most soil conditions.